Customized white frame classic sunglasses w/9 colors appeal with their white frames and dark lenses. Offered in 9 bright and bold colors, these white frame sunglasses easily become a head turner, when you step out wearing it. This classic sunglass offers UV 400 protection and makes one trendy fashion choice at all times. It is perfect for summer tradeshow gifting, corporate gifting and more. Save huge on wholesale orders of these custom white frame classic sunglasses. 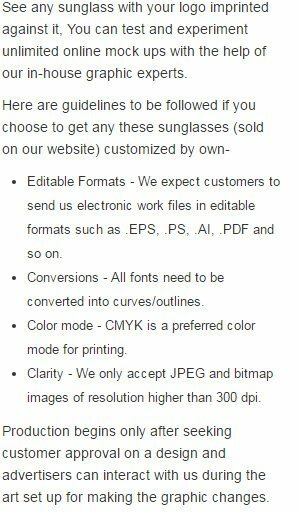 Request a quote to know bulk order savings for these promotional white frame classic sunglasses w/9 colors. When ordering blank items of this product either exactly 1 or atleast '+65+' must be ordered!